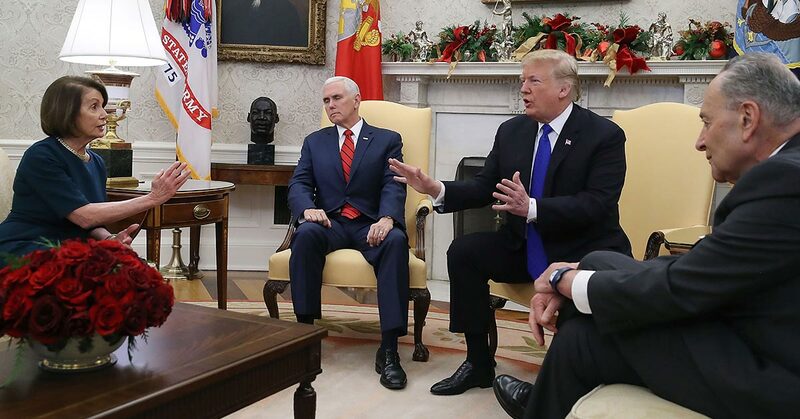 WASHINGTON, D.C. -- Americans are ending the year feeling as conflicted about the state of the country as they were in January. Most remain confident that the labor market is favorable for job-seekers while about half feel positive about current economic conditions, as well as the direction in which the economy is going. At the same time, less than a third are satisfied with the way things are going in the U.S. overall. Slight shifts in these mood perceptions have occurred during the year, most notably a 10-point drop in the past month -- from 57% in November to 47% today -- in the percentage of Americans who believe the economy is getting better. Nearly as many, 45%, now think it is getting worse, marking the first time since April that less than a majority has felt optimistic about the economy. Americans' assessment of current economic conditions also dipped in the past month, although less sharply than their assessment of the economy's direction. 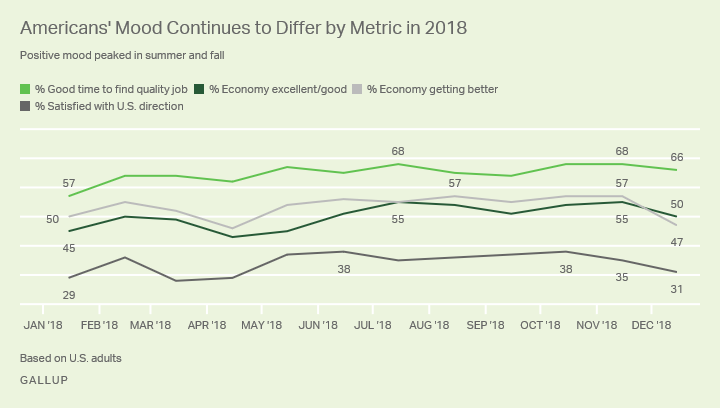 Half of U.S. adults now rate the economy as excellent or good, down from 55% in November; however, this is still slightly better than the 45% recorded at the start of the year. Americans' broad satisfaction with the direction of the country has slipped seven points since October when the percentage satisfied had returned to the year's highest level of 38%, previously recorded in June. The current 31% feeling satisfied is back on par with January's 29%. From a long-term perspective, Americans' economic perceptions remain much more positive than they were during the 2007-2009 recession and multi-year recovery period that followed. Their current level of satisfaction with the direction of the country is high compared with levels seen during that period, but significantly lower than earlier years. As is customary, Americans of different demographic and political backgrounds see the country very differently. This is especially true for ratings of current economic conditions and perceptions of the economy's direction. Majorities of men, whites and Republicans are upbeat about national conditions while their counterparts are more negative. And the same pattern is evident in satisfaction with the overall direction of the country. 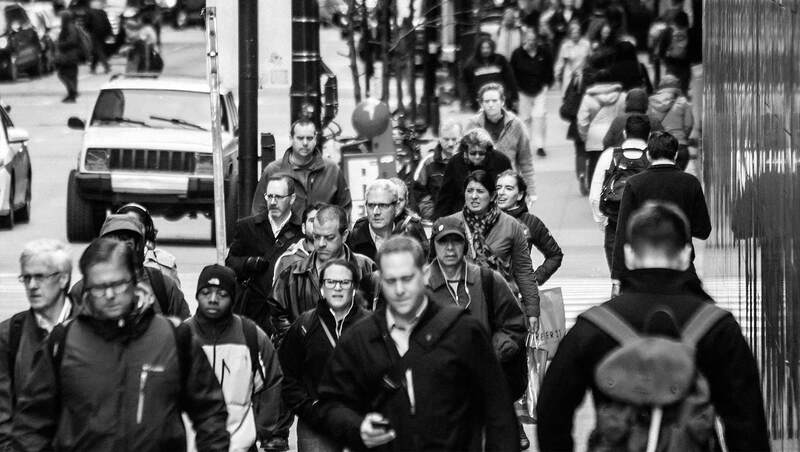 There are only modest differences between income groups. Americans in households earning $100,000 or more are much more positive than those in lower-income households about current economic conditions. But there is little difference in people's economic outlook or satisfaction with the direction of the country by income. One thing the majority of all groups agree on is that it remains a good time to find a quality job. At the end of an eventful year on the domestic front, which included rising interest rates, sharp swings in the stock market, a raucous Supreme Court nomination process, political battles in Washington over immigration, and major Democratic gains in the midterm elections, public satisfaction with the direction of the country remains on the high end of the subdued level recorded over the past decade. At the same time, Americans remain confident in the availability of good jobs, though they are less confident that the economy is in good shape or will continue to improve. Sixty-one percent of U.S. investors are concerned about stock market volatility, but more are optimistic (49%) than pessimistic (28%) about the market's performance in the coming year.